As you may know, we do things a little differently around here. Below you’ll find the basic DO’s and DON’Ts for entertaining with cool, creamy—and we might even say “dreamy”—Dean’s® Dairy Dip. DO put Dean’s Dip on burgers (or dip burgers in Dean’s?). DO try Dean’s instead of sour cream on baked potatoes and tacos. 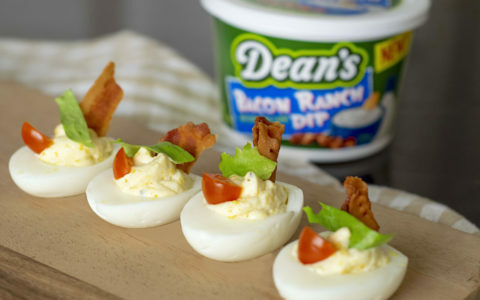 DO use Dean’s as a delicious replacement for mayo on sandwiches and in salads. DO remember that pizza crust is not the end but a new beginning (when you dip it!). And DO have a variety of flavors on hand–from classics like French Onion to new faves like Bacon Ranch. Because Real Dippers dip what others deem undippable. DON’T double dip (unless that means bringing two tubs of Dean’s Dip). DON’T be a dip hog and take the whole tub to your own private corner of the party. DON’T fish a broken chip out of the bowl with your finger—use another chip! DON’T just walk away if you spill dip on the carpet. Inform your host and help clean it up. DON’T lick the underside of the lid (unless you know you’re going to eat the whole tub). Check out even more delicious recipes here. to stay on top of the latest recipes and entertaining ideas.